Carol Bossert's podcast is a must-listen for museum folks. It was a great pleasure to be interviewed by this lively and curious host about food history, memory, and interpretation in museums. How we used "140 years of family events" - tragedies, celebrations, loves and losses - to bring four generations to life in a historic mansion. "We're always pushing ourselves to try new strategies to create a more sensory, accessible, and inviting experience." Celebrating two woodworking-themed exhibitions (The Art of Wood and In Plain Sight), the event brought out 700 guests to go against the grain and carve out a new identity. Globe correspondent Jill Radksen called the evening "hipster central." Photo gallery here. Audiences loved this "Digital Detox," a device-free night of handmade creativity and person-to-person communication, packed with analog art, imagination, and conversation. Artist and cycle advocate "Skunk" posted this after-action report of "bike gang" SCUL's participation in PEM/PM's Bring Your Own Bike Night. 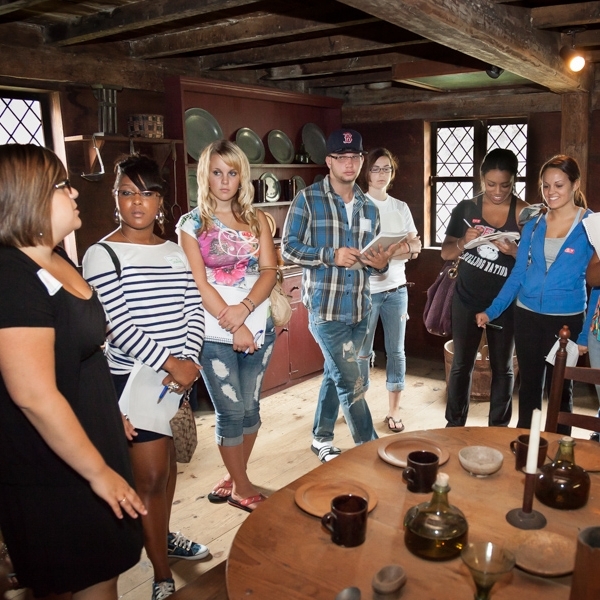 Working with Salem State faculty and PEM educators and volunteer docents, I initiated PEM's partnership on this summer program for incoming students, designed to accelerate their academic skills in preparation for freshman year. Read more about Summerbridge on the PEM blog, Connected. An unforgettable evening of fabulous costumes, sitcom trivia and TV theme karoake, all in homage to the exhibition California Design 1930-1965: Living in a Modern Way. The arts of gardening, agriculture and green living were the focus of May 2013's PEM/PM. "From studies of cornucopias to landscapes capturing fishermen at work and replicas of trade ships, it quickly became obvious how subtly food and agriculture had made a home at PEM. It was riveting..."
"Moon has built her personal and professional life around the belief that education empowers individuals and helps shape healthy communities...."Michelle gets that everything we do comes down to education to make the community and world we live in a better place." A chance encounter with author Joan Nathan, an expert on the history of Jewish cuisine, led to this wonderful holiday story featuring Mrs. Shapiro, a roleplaying character at Strawbery Banke Museum whose culinary presentations are informed by detailed curatorial and horticultural research. This profile by arts journalist Jeanne' McCartin focuses on A Winter's Tale, a first-person live storytelling series my partner Steve Johnson and I co-produced in Portsmouth for three years.